Complex legal issues require advice from experienced attorneys. Litigation objectives can only be effectively and efficiently achieved by a firm of proven trial attorneys. Kipp and Christian is a Salt Lake City trial firm with the experience and knowledge to carry a legal challenge from end to end, consistently delivering the optimum results for our clients. We combine the resources and prestige of a long-established, downtown law firm with our commitment to providing the latest, most innovative strategies for our clients' legal challenges. That's our clients' edge. 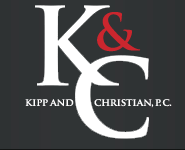 Kipp and Christian represents companies and other employers in cases involving claims of sexual harassment, hostile work environment, wrongful discharge, discrimination, Family Medical Leave Act claims, COBRA issues, Americans with Disability Act (ADA) claims, and other employment related matters. Admitted to bar: 1965, Utah. Education: Utah State University (B.S., 1962); University of Utah (J.D., 1965). Member: Salt Lake County and American Bar Associations; Utah State Bar; Fellow, American College of Trial Lawyers (State Chair, 1995-1997); American Inn of Court II. Practice Areas: Professional Malpractice; Products Liability Law; Personal Injury; Commercial Law; Financial Transactions Litigation; Insurance Coverage Litigation.